Hibernian striker Jason Cummings maintains he is committed to helping the Easter Road side to promotion despite serious transfer interest from Peterborough United. The Leith club rejected a bid of £1.2m plus add-ons for the 21-year-old. 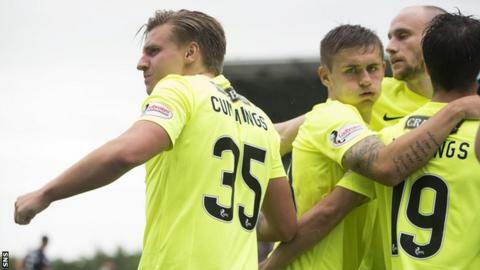 "I'm completely focused on Hibs this season and my main aim is to get Hibs up," Cummings told BBC Scotland. "I said the day we went down that I want to get us back in the Premiership and I'm sticking with my word." Cummings scored both goals in Hibs' 2-1 win at Falkirk on the opening day of the Championship league season to give manager Neil Lennon three points at the beginning of his domestic tenure at the club. "I'm flattered with the offer," said Cummings. "If anything it makes me more confident. "I came out here today as confident as ever and you do thrive on someone coming in and saying you're worth over a million. It doesn't put pressure on me at all. "But I'm focused on Hibs and I'm going to do all I can to get Hibs up. "I'm only 21 and I'm still young. Down south probably would appeal to me later in my career, but just now I'm happy up here in Edinburgh with my family with my mum who does everything for me - I'd be lost without her. "If I went down there I would kind of lose my way a wee bit." Hibs boss Lennon confirmed pre-match that the club had no plans at the moment to accept any further bids that come their way from the League One side. "Everyone has their price but I would doubt a lot of clubs could match what we think of Jason at the minute," Lennon told BBC Scotland. "He's a great kid and he's worked really, really hard pre-season on his fitness and you could see that today. "He showed a nice turn of pace and could've had three or four goals, without being disrespectful to Falkirk. "A bid came in on Thursday and I spoke to Leeann Dempster and the board and we're quite comfortable with the situation of not selling him. "We don't need to sell him and we did a lot of work in the summer to get Jason on a long-term contract. He seems happy and I think he's far better off with us at the minute to keep developing."